The first meeting of the new year in January was an excellent illustrated talk by Society member and popular speaker David Holt entitled ‘Charles Babbage – his life and achievements’ very aptly subtitled ‘200 Years to Recognise a Genius’. As with David’s previous talks this one was very entertaining and informative being well received by a large audience which included several visitors. It seems Society events are now so popular people are undeterred by bad weather. In February the Society holds its Annual General Meeting which is followed directly by a Members’ Evening, and as the Society is now ten years old there will be a cake! The members’ evening presentation is to be an illustrated talk by members Roger Gelder and George Ross entitled ‘Our Summer Visit to The Tower of London’ covering the history of the building and the many famous people who were held there over the last 900 years. Next month a full report of this meeting will be given with hopefully news of some new members joining the Society’s Committee. The History Society’s next event is scheduled for Monday the 18th March 2013 and will be held as usual at 7:45pm in the Methodist Church when one of our members David Butler will give a talk entitled ‘Passport to Paris : The Start of a Family Story’. 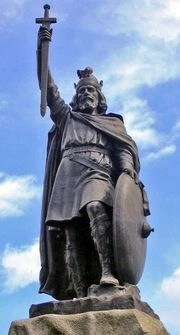 On Monday the 15th April 2013 in the Methodist Church at 7:45pm local historian and popular speaker Bert Pridgeon is to give an illustrated talk on King Alfred the Great. This should be very interesting as Alfred was born locally at Wantage and became an outstanding Saxon King reigning from 871 to 899. Perhaps they can find his bones!